Have you ever asked yourself why you're often told that yogurt is good for you? Let’s be honest: yogurt is essentially fermented milk. However, it contains probiotics, which play an important role in your body’s essential functions. It may come as a surprise to you, but your body has bacteria that outnumber your human cells by a factor of 10 to 1! That's a lot of living organisms in your body! Like many other organisms, they can be good, or bad. While the common perception of bacteria is that they are harmful, the “good" bacteria in your body actually play important roles in your health, particularly those involved with metabolism and nutrition. But what exactly are probiotics? According to the World Health Organization, they are described as “live microorganisms which, when administrated in adequate amounts, confer a health benefit on the host”. Simple enough, right? 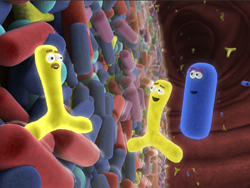 Let’s make it simpler: Probiotics pretty much mean “for life”! But what do they do for you? Probiotics have long been recognized for promoting digestive health. You are most familiar with the use of probiotics in yogurt. But these organisms can be found in other dairy products as well, and are also sold as supplements in health food stores. More recently, experts have come to recognize the role probiotics can play in oral and dental health. Probiotics are “friendly” bacteria; they can help protect your body against their evil twins (destructive bacteria), aid in digestion, and generally foster a healthy environment. The health benefits of probiotics come from the fact that they are living microorganisms inside your body, constantly on the lookout for "bad" bacteria. By keeping them at bay, they can keep your body strong and from becoming ill. But what does this have to do with oral health? Traditionally, the first line of defense against harmful bacteria has been by diligent brushing, keeping your mouth clean. However, that is not an effective way of getting rid of them, as it not only makes room for more bacteria, but also kills “friendly” bacteria in the bargain. Recently, experts have come to discover that the use of probiotics will do exactly that---kill harmful bacteria, while replacing them with “friendly” bacteria. This is how probiotics play a very important role in your oral and dental health. For the best results, include them in your diet, and use probiotic toothpaste every day.